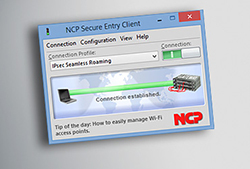 The NCP Secure Entry Client Suite for Windows, Android and OS X features an integrated personal firewall, integrated dialer, and a GUI that looks and functions similarly across all devices. 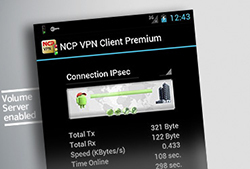 It is compatible with all common VPN Gateways and designed for single users and small installations. The centrally managed NCP Secure Enterprise Solution provides scalability and cost efficiencies for large remote access VPN installations. 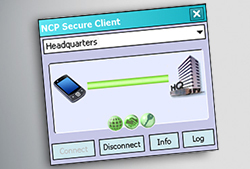 View Client Comparison - Features of the different NCP Secure Clients (PDF). 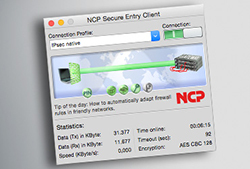 The NCP VPN Clients for OS X 10.10 Yosemite, OS X 10.9 Mavericks and OS X 10.8 Mountain Lion enable easy VPN access with just one click.